Have you ever thought about what happens in the middle of the night after you go to sleep? Well, my poet friend, Laura Purdie Salas has. 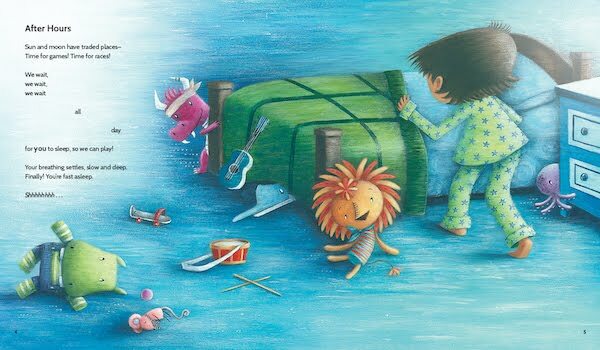 In her imaginative picture book, inanimate objects decide it's time to play when their humans go to sleep. Join me as I take you on a quick trip through Laura's fantastic flight of fantasy. Welcome to the last day of her latest book's Blog Tour. For several weeks, I have been waiting to present IN THE MIDDLE OF THE NIGHT to my reading audience. If you have not visited one of the spots on the tour (see below), then I invite you to take a seat and hold on for a fascinating flight of fantasy. 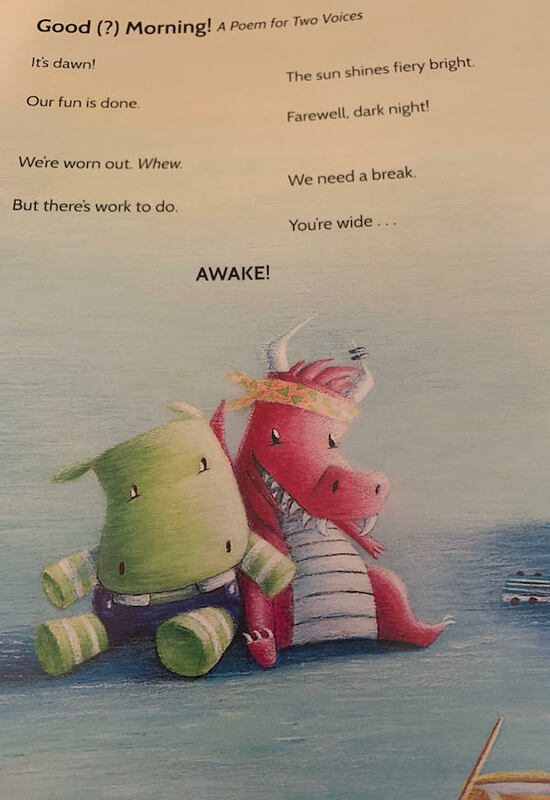 If you have traveled to some of the Blog Tour spots, then you already know what an amazing book this is to read to toddlers before bedtime or to older children in school. Even adults will enjoy this madcap adventure of inanimate objects. Through twenty-six imaginative poems, Laura captures the after-dark adventures of household objects who want to enjoy life as much as their humans. Illustrator Angela Matteson brings inanimate objects to life in vivid illustrations with creative flair. There is movement as their stories are revealed. Some objects even spin and show emotions. for you to sleep , so we can play! Did you see the animal in the illustration above sneaking from behind the bed to play or the octopus hiding by the dresser? 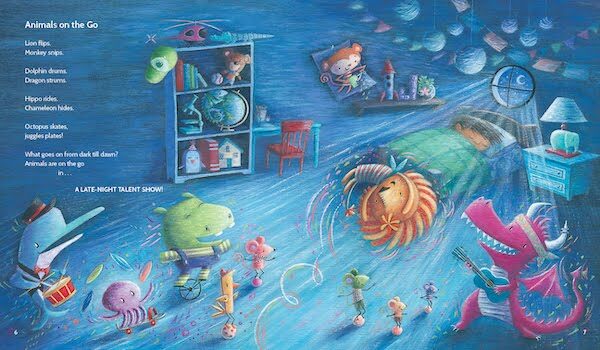 Angela's illustrations playfully depict toys that are simply waiting for their little boy to go to sleep so they can unwind under the light of the crescent moon. Unwind they do as Laura spins her tale of animals on the go and Angela has the characters moving, spinning, and rocking to the beat as they prepare a late night talent show. As the animals unwind, other objects start their own merriment. Laura uses rhyming, repetition, strong verbs, and sound words to lead us into the adventure that sends a paper airplane on a moonlight midnight flight at the same time the lidless markers sound off with their woeful tale. 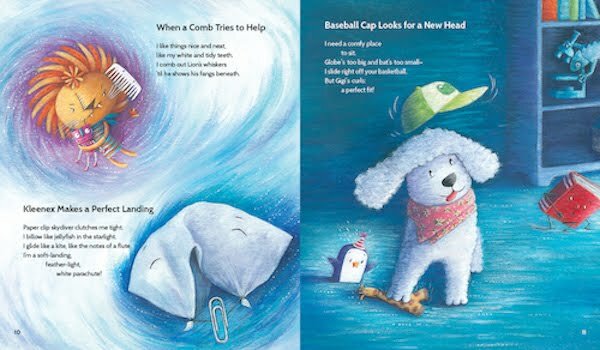 A comb tries to help, a kleenex in the shape of a jellyfish parachute makes a soft landing, and a whirling baseball cap searches for a new head to fit. Have I intrigued you with the beginning of Laura's amazing after-dark tale? Well, there is more to this poetry-packed children's book. There's an acrostic poem being told by a perfume atomizer all dressed in pink. Pencils take a plunge and land with a loud thump. A mixing bowl gets mixed up. There's even spaghetti that tries to fit in as sneaker laces. Can you imagine that? Laura even slipped in one of her newest creations, an equation poem told by a rock, "End of day=time to play." This book may be filled with 26 individual poems but each transitions beautifully to another with a rhythmic beat to build the storyline. Inanimate objects going wild is the end result until morning when their "fun is done." A two-voice poem concludes the book that shares merriment that goes on after dark. To extend the reading experience into a writing one, ask children to create their own fantastic journeys after dark using Laura's poems as models. If you travel to Reflections on the Tech and Reading to the Core, you will see poems from Margaret Gibson's class in Louisiana and Catherine Flynn's class in Connecticut. These poems illustrate the creativity and imagination of elementary children. IN THE MIDDLE OF THE NIGHT will not only spark interest in poetry but encourage children to become lifelong readers and writers. Thank you, Laura for an imaginative tale from a wide-awake house. As I ready for bed, I am wondering what type of after-dark activities will my house engage in. The heating system enjoys making whoosh sounds when it mysteriously turns on in the wee hours of the morning. Sometimes, the alarm goes off with its blaring beep. Let's not forget to continue to nurture our children's creativity and imagination. 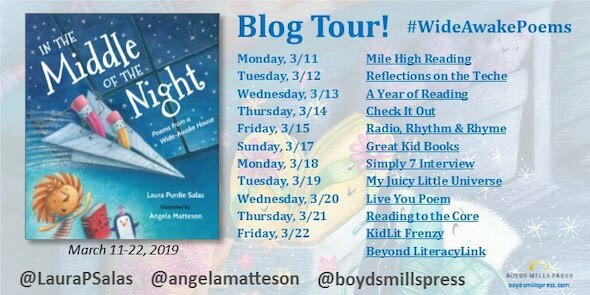 Check out the tweets about IN THE MIDDLE OF THE NIGHT at #WideAwakePoems and enjoy reading other posts on the Blog Tour. Thank you, Laura and Angela, for such a wonderful, imaginative book geared to readers of all ages. I fell in love with it and am eager to see how my grandbaby will respond. Her library is growing since before birth when Laura sent a signed copy of one of her poetry books for the baby shower. To win a copy of In The Middle of the Night from Boyds Mills Press, comment on Laura's book below. Include why you would like to read it. A winner from the U.S. only will be chosen on Sunday, March 24, 2019. I will announce the winner on my blog site and on Twitter. 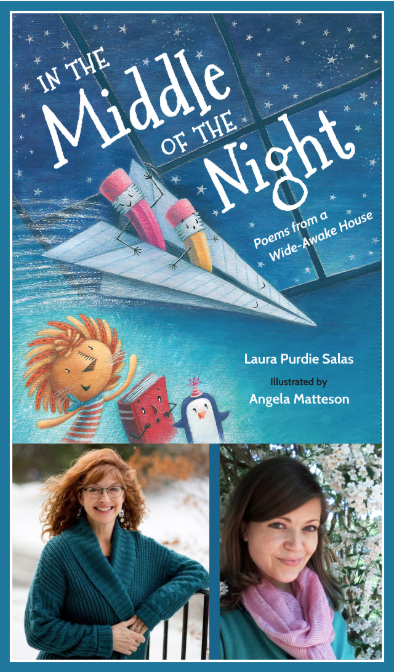 Today I am celebrating Laura Purdie Salas' book with two writing communities: Poetry Friday and Two Writing Teachers. 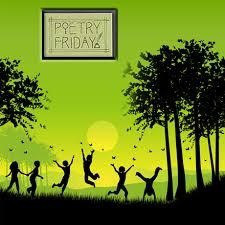 Rebecca Herzog is hosting Poetry Friday at her blog, Sloth Reads, with a nod to Happy Goof-off Day and an original poem. Two Writing Teachers is past the halfway mark for their 12th Annual Slice of Life Story Challenge. Just ordered it -- looks great! I love how you analyzed the illustrations as well. Thank you for sharing it with us. Clare, I am so glad that you ordered Laura's book. When I wrote the review that was scheduled for today, I started thinking that it was not a short slice. But it was a fun piece to write since the book was so amusing. Laura, your book is a winner. You must be thrilled with the way it has been welcomed into the kidlit world! Have a great time at the Book Festival. This book looks amazing! I have a fellow teacher expecting her first baby, this would be perfect for her! My nieces and their children would be fascinated to red/listen to this book as well. The illustrations along with the poems are sooo beautiful! Jaana, I agree that Laura's book will be a a wonderful first baby gift. The latest showers I attended all asked for books to build the expectant babies' libraries. Thanks, Jaana. I'm honored at the thought of my book as a shower gift! Thank you for sharing! Laura's book looks delightful and I know it would be so much fun to read with my kiddos! Yes, Rebecca, Laura's book is one of my favorites. I want to see if my 21-month-old grandbaby will like listening to the tale. Christie, your comment reminds me of children who bring their flashlight to bed to read in the dark. Wait for a rainy night and curl up with your copy of Laura's book. You will have fun reading it. I would love to hear what your kinders think of the poems. I bet they will like the rhymes. I have books like that waiting for me, too, Christie. I hope you enjoy it when you get to it! Your review is spot-on, Carol! In the Middle of the Night is so imaginative and fun, it's sure to inspire children with ideas to write their own poems! Thanks for stopping by, Catherine. What a great blog tour Laura's book had. All the inanimate objects must be exhausted by now. They traveled for 11 days and visited 12 blog sites. Maybe your students could reflect on that and write what the objects' next adventure would be. Diane, years ago I worked in a school district that received a huge amount of money. The 4 elementary schools were asked to choose a school reform model. Paideia was one of the models that another school embraced. My school chose Accelerated Learning by Hank Levin. We got to meet him in NYC and were invited to model programs. I think your students and teachers would love to taste Laura's book. It will open the door to discussions and creative thinking. What a wonderful review. I love the sneaky animals and the perfume atomizer come to life to let us know what goes on in the middle of the night. My heating system has special sounds too! The one that gets me thinking....is the sump pump. I always want to hear that one whoosh and gurgle! I'm sharing this great review with friends. Thanks, Carol! Linda, thank you for joining me to wonder what goes on at night in our houses after dark. Laura has written a treasured tale that is humorous and fun to read. It sparks our imaginations to write our own fanciful poems on our forgotten household objects. Each morning, I wake to the humming of my bathroom heater. It sings it’s song telling me it’s time to wake up and shower. Who knows what happens when i’m asleep. I would love for my heater to meet up with your sump pump. Maybe they could start start their own band. This book looks like so much fun. I love the illustrations and, of course, Laura's poetry is excellent. I can imagine reading this with my own children & seeing what they can create. And lately I am increasingly inclined to offer my risk-averse grade 10 writers fun like this to see what they can do with it. In fact, I'm planning to use Margaret's Bayou Song next month. Should be fun. Thanks for a great review! Amanda, I am glad that you are thinking of sharing Laura's book with 10th graders. I am consulting with HS and MS Humanities teachers in one district. I thought I would share Laura's book with them and see what they think about it. When you finish your work with the Bayou Song, would you please let me know how the students reacted? Amanda, I'd love to know what 10th graders make of it! Bayou Song is so amazing. I love the writing and art prompts. I love the energy in Laura's new book. We used to always pretend that my daughter's stuffed animals played anytime we left the house. But In the Middle of the Night adventures provide just the right amount of playfulness and poetry. I think Jack would enjoy this book. He amazes me by listening to poetry books. He already likes Irene Latham's Fresh Delicious. Ramona, thanks for stopping by. I am so glad that you love Laura's book as much as I do. Did your daughter ever let you know what her stuffed animals did when she left. Do you tell Jack or Teddy the same tale about stuffed animals? I did not have time reading Laura's book to Sierra this weekend because she had her favorites that she pretends-read: mostly board books that she can open easily. Next time I will bring the hardbound book of Laura's not the arc. Sierra did amaze me that she knew Hop on Pop. She said Pop, pointing to it so she could read it herself. Thanks for stopping by, Jama! Jama, thank you for your comment. I value your expertise as a children's book reviewer, so I truly appreciate you stopping by. I can't wait to share the book with my grandbaby the next time I visit her. I was lucky enough to win a copy from another blog tour stop, so no need to put me in the drawing, but I have enjoyed every stop on the tour, and I'm so looking forward to having a copy of my own. Carol, thanks for sharing your take and for the classroom tips you offered to extend the book. I am glad that you are getting a copy of Laura's book, Kimberly. You will really enjoy it. I am visiting my granddaughter this weekend so I am way behind in my PF reading. Thanks so much for being such a faithful follower of the blog tour, Kimberly. They're such sprawling things, and so much work goes into them. Every host and every reader really makes a difference! Laura's book looks FANTASTIC, thanks for your terrific review of it Carol. The lively art goes so well with the poems, I'd like to jump into the pages and join them! Jumping into the pages would be a fun action to take, Michelle. There is so much motion that you might be sucked into the book. Laura and Angela made a great duo. AND THE WINNER OF THE GIVEAWAY IS REBECCA HERZOG. CONGRATULATIONS! 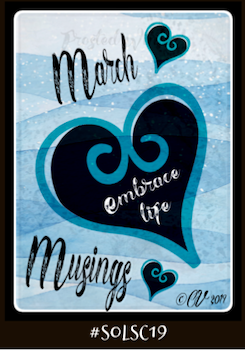 March Musing '19: Spring Is In The Air!